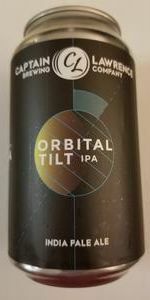 Orbital Tilt - Citra | Captain Lawrence Brewing Co.
As the Earth spins and twists, so does your mood, so does your taste, and so does Orbital Tilt. This IPA has been brewed using a healthy dose of imported Pilsner malt and malted oats to create a smooth mouthfeel. Finished off by dry hopping with a blend of Citra lupulin powder and pellets for a tropical aroma and finish. They are using pilsner malt and vic secret hops. This is a rotating hops beer and also a single malt single hop beer. SMASH for short. Pours like orange juice with a soft milky orange body and creamy peppered prickly foam that sits and grabs the glass as it falls. Perfumey sweaty hops with orange lemon and dank weeds and floral pepper. Sweet candy with a fuller cracker malt and dry lemony hops. Straw and not too much earth or sweet spice. Dank and dry. Juicy floral. Juicy in hops is the floral. The vic secret have an icy cool quality that is also grassy. Tropical berry in back. You could say it's a new sensation. Finishes with softer bubbles and a bit sharper bitterness. Orange juice and pine. Lambic pentameter said it best in a thread "They also "produce fruit juice flavors" by adding fruit, rather than emphasizing the natural FRUIT-IMPRESSION flavors that are common in many varieties of hops. I would (and I suspect many brewers of NEIPA) would object to the notion that underattenuation is a core characteristic of the style. Again, the proper representation of the style isn't actually supposed to be sweet, although the lower bitterness and creamy mouthfeel can give that impression." As much as this beer reminds you of orange juice it's more piney than orange. I am so disappointed in myself! I CANnot believe that I did not realize that Orbital Tilt was a single-hop series! 8=( The CANQuest (tm) CAN't grab 'em all in this day & age, but I may have glossed over some that I could have procured. From the CAN: "As the Earth spins and twists, so does your mood, so does your taste, and so does Orbital Tilt. This IPA has been brewed using a healthy dose of imported Pilsner malt and malted oats to create a smooth mouthfeel. Finished off by dry hopping with a blend of Citra lupulin powder and pellets for a tropical aroma and finish." I love the smell of lupulin in the morning, so I Crack!ed open the lid's vent & beCAN a Gussie Busch Glug. This raised two fingers of dense, foamy, rocky, tawny head with very good retention that left loads of lacing in its wake. Color was Golden-Amber (SRM = > 5, < 7) with NE-quality clarity, enticing a visit from The Gelt Gang of Mammon, Midas & Croesus, all anxious for a taste. Nose smelled like fresh grapefruit & if that doesn't rev your hophead engine, I don't know what will/would! Mouthfeel was medium-to-full, not quite creamy, but close. The taste was kind of perplexing in that the nose led me to expect grapefruit bitterness and yet in addition to that, I got an orange sweetness. Either way, it was very citrusy in its flavor & it was making me happy. There was a slight chalkiness to the finish, leading me to wonder if they might have saturated or oversaturated the beer with all of the hop additions. Finish was dry, bitter & more towards grapefruit than orange, although that persisted. This was a solid AIPA & I hope to be able to lay hands on the others in the series. Lupulin Powder may working well. Good balance of the Hops and Molts. We ordered this, untested, on our beer guy's suggestion. Oh my!! Bright and refreshing nose. Crisp, slightly citrus hop bite, with smooth mouth feel, and nice balance. This was truly a crowd pleaser! Orbital Tilt - Citra from Captain Lawrence Brewing Co.